Photos and video can be even more personal than a handwritten card. That’s why Hallmark has just acquired SpiritClips, an online video production and streaming service that also makes personalized digital greeting cards. It looks like Hallmark customers will soon be able to create and send e-cards by uploading their own photos or choosing from video content created by SpiritClips. Hallmark already has its own line of animated video e-cards, but they’re not very personalized. As more of our intimate connections happen online, the SpiritClips acquisition will let Hallmark stay relevant rather than living off its dead-tree printing business. SpiritClips has been running a $3 to $5 a month subscription service where users could get streaming access to an array of heartwarming, family-friendly films and documentaries produced by the company and sourced from elsewhere. Customers could also create personalized digital greeting cards where they upload photos and SpiritClips then collates them into videos. Now its content, team, and tech will serve Hallmark customers. The two companies were already working together, as SpiritClips is the official online, on-demand, and streaming-to-tv provider for Hallmark’s Hall Of Fame inspirational film series. Hall Of Fame has been delivering original content to TV since the 1950’s, and the SpiritClips production staff should make its films even warmer and fuzzier. The startup’s team will continue to operate from its California headquarters rather than moving in with Hallmark in Kansas City, Mo. While services like Animoto may offer more powerful photo and video editing tools for creating e-cards, they could be too complicated for the average Hallmark customer. 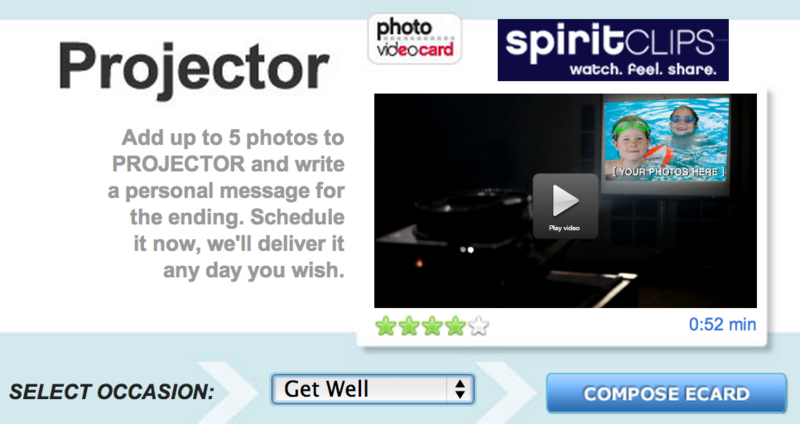 Hallmark could use SpiritClips to make it as simple as possible to create e-cards full of user generated content. That way Hallmark could could bring even its least-savvy offline customers into the modern age where 1s and 0s can express love.